The new Peacock Cellars winery/tasting room in rural Arroyo Grande. 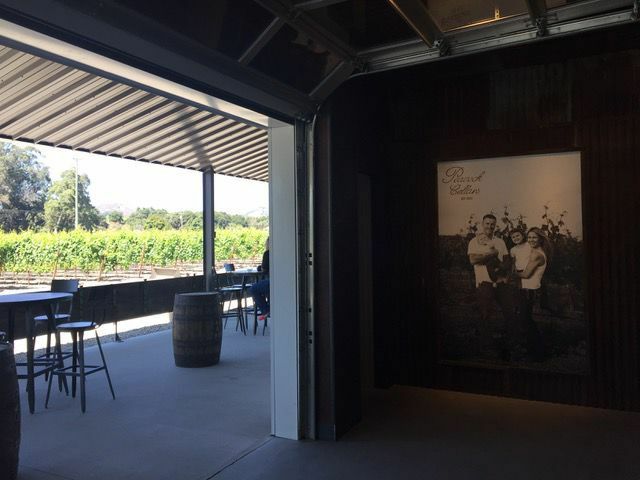 The Peacock Cellars tasting room features a Nichols family photo to remind visitors it’s a small, family-run farm. The side patio produce and fruit stand next to the tasting room. It had been several years since I first visited Peacock Cellars, after hearing this small family-owned farm offered a winning combination of wine tasting and seasonal produce. I found that quite appealing. But my short drive was cut short upon finding the quaint farm on Los Berros Road in Arroyo Grande, an unmanned fruit and produce stand. Wine tasting wasn’t available that day (I’ve long since forgotten which weekday it was). It was the typical sort of small family farm stand where you pay for your purchase by shoving your money through a slot in a locked cashbox, set below a prominent sign that warned: "God is watching you.” (There was a sinner stealing those money boxes in the rural neighborhood). Since I had already filled my pantry with fresh seasonal goods from the Arroyo Grande Farmers Market, I wasn’t interested in produce that day. I was there just to check out their wines. I didn’t think about it again for several years until a friend, Heidy Jackson Mangiardi, who's also my aerobics teacher, told me she was putting together a group of friends to meet in Peacock Cellar’s tasting room. She belongs to their wine club, so I gladly said I would meet her fun group there. You can probably imagine what a surprise it was to find the tasting bar wasn’t simply a long plank atop a couple of old wine barrels where you stood to taste their wines beside the quaint old produce stand. The new tasting room and winery is modern and beautiful with a viewing window for a look at the wines aging in barrels, a front patio for relaxing while enjoying the tasting with friends and a side patio dedicated to showcasing their gorgeous, seasonal produce and fruit. The shaded produce market sells freshly harvested peaches, nectarines, tomatoes, garlic, nuts and gift items. I left with tasty tomatoes and nectarines, besides the delicious wines I purchased. You can expect the farm shop to continue to offer an array of summertime’s best produce through September. Everything on the farm is sustainably raised, and they are now open year-round. 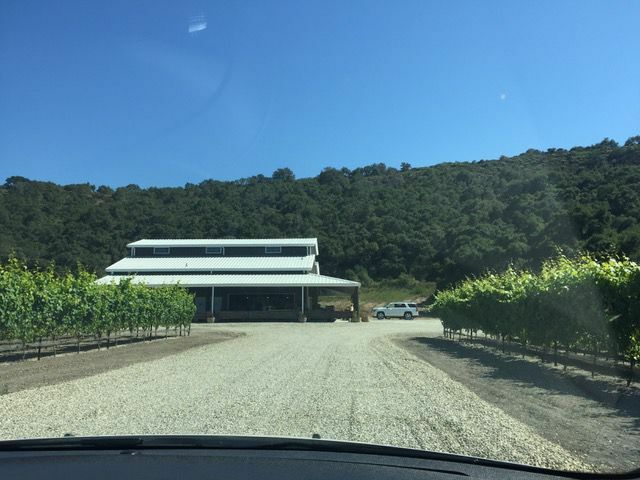 Logan and Jessica Nichols, the owners and operators of Peacock Cellars, recently built the brand-new, contemporary winery/tasting room behind their vineyard alongside Los Berros Road. There a long tasting bar where you can taste through their current wine releases. There were six wines on the tasting menu when I visited in July, a 2015 chardonnay, 2014 viognier, 2013 pinot noir, 2013 barbera, 2015 tempranillo and 2013 Znfandel. As we advanced through the whites to the red wines, I asked vintner/winemaker Logan Nichols, whom we were lucky to find pouring tastes that day, if he preferred riper wines (which I tasted in the bolder, voluptuous reds following the pinot noir). “I lean to ripeness in all of my wines," Nichols said. Although I must admit I do not prefer bold ripeness, that’s mostly because I don’t like high alcohol levels (above 14. 5 percent) in red wines. That said, I did find his wines very balanced in ripeness and acidity, which is the mark of a good winemaker and an exceptional vineyard. Not only that, more people in our group preferred those riper wines, while I purchased the lighter style pinot noir, my favorites among the reds. The tempranillo, a fantastic classic Spanish wine variety, was also a favorite. They also offer a list of 19 library wines, which included whites, rose, medium bodied reds, big and bold reds and dessert wines, available for purchase only. The wines range in price from $20 to $36 on average, but there are some pricier, aged library wines that are gems for wine connoisseurs. Nichols told me they purchased the property in 2006, the same year they planted the vineyard. They also farm vineyards planted with sangiovese, tempranillo and barbera in San Miguel (north of Paso Robles) to get the riper flavors they prefer in the winegrapes. They chose the brand name for Jessica’s maiden name Peacock, and they’re raising their two children, Rebecca and Wyatt, on the farm. A wall-sized family photo of them in the vineyard greets everyone in the tasting room, a sweet reminder this is a small family owned and operated farm and estate winery with vineyards. Apparently, they both are in their success at making their dream come true. Kathy Marcks Hardesty can be reached at kathy@centralcoastcritic.com. Tasting fee: There is a tasting fee of $15 per guest, although you can share a tasting glass for one fee of $15. The fee is waived if you join the wine club and/or purchase a bottle of their wine. Groups: On the webpage, they warn you that they cannot accommodate large groups, limos or buses. Fruits: Don’t forget your recycle bags to buy recently harvested heirloom tomatoes or ripe juicy peaches.